Falls are a significant health issue with considerable cost to the community in terms of pain and suffering of the individual and family and medical costs. 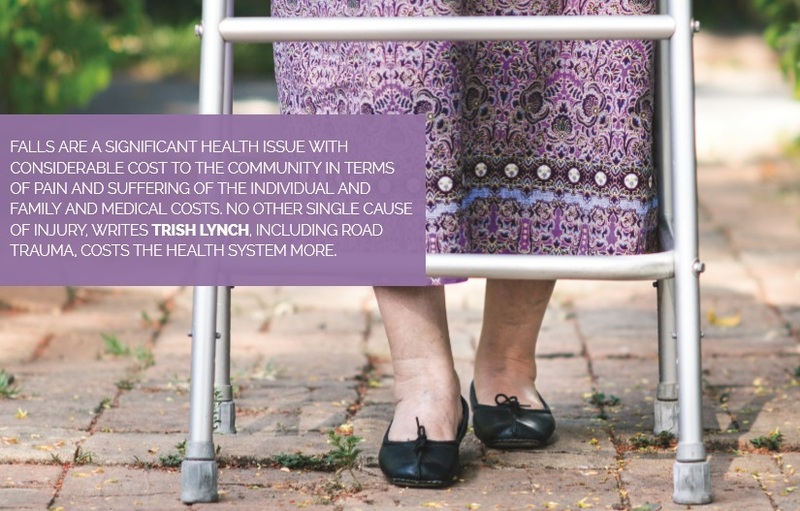 No other single cause of injury, writes Trish Lynch, including road trauma, costs the health system more than falls. The NSW Health policy, Falls – Prevention of Falls and Harm from Falls among Older People: 2011-2015, emphasises the significance of falls and their effects and discusses the various approaches to reducing the number of preventable falls. The main aim of falls prevention is to keep people active, healthy, independent and in their own homes. One in four people over 65 years will have a fall in a 12-month period. This can result in minor injuries such as bruises, sprains and strains, significant injuries such as fractures of the hip and pelvis, placement in supported accommodation such as aged care facilities and, in some cases, death. The likelihood of people falling increases as one becomes older. One is more likely to fall when over 85 years old. There has been extensive research demonstrating that many falls among older people can be prevented or the injury can be reduced, even in frail older people. The other significant outcome can be a fear of falling which results in loss of confidence of the individual which can reduce the amount of community involvement and activity of the person who has had a fall. Many people over 65 years old report that they rarely leave their homes as they are very fearful about falling and the possibility of breaking a bone or worse. This social isolation can result in even more chance of falling as they become weaker and can’t balance as well as they used to. International research, however has shown that a significant number of falls are preventable. The single most effective thing to do to reduce the risk of falls is to participate in regular exercise programs that target balance and leg strength. These programs can be simple exercise programs using leg weights that are appropriate for the individual and contain some exercises that target balance specifically. Another option is to attend a Tai Chi class on a regular basis. The NSW Ministry of Health has a booklet called Staying active and on your feet. This booklet contains a home safety checklist to assist you identifying possible chances of falling. Another area where falls occur is crossing the road. Being aware of pedestrian safety techniques such as crossing at designated crossings, making sure the driver has seen you before stepping off the footpath and crossing at traffic lights only when the green walk symbol is displayed. Wear light or bright coloured clothes, particularly on dull days, this will help drivers to see you. If not, carry a bright bag. Trips can occur easily when out and about. Scanning ahead can help to identify trip hazards such as uneven footpaths, tree roots, clumps of grass and foliage on the ground. Once a hazard has been identified you can avoid it rather than possibly trip over. The South Eastern Sydney Local Health District, runs a falls prevention program called Stepping On. It is a is a free, fun, two hours a week, seven-week program conducted in community venues that addresses the multifaceted risk factors that can cause you to fall. The main aim of the program is to help keep people active and independent and in their own homes by informing them about falls hazards and what they can do. The program is interactive and involves discussion. Experts in the falls hazards areas present information. Exercises that address balance and leg strength are explained and practiced at the sessions. To find out more please call the Stepping On Coordinator on 1800 823 002 (free call) or email on steppingon@sesiahs.health.nsw.gov.au. Prior to attending Jim* was falling so often that he was using the ambulance service like a taxi from his home to the emergency department at Prince of Wales hospital. Since finishing Stepping On Jim has not fallen and walks more confidently. Maria* was so scared about falling in the street, being embarrassed and not being able to get up, that she stayed at home all day. Since finishing Stepping On Maria has continued to meet with some of the participants weekly due to her increased confidence. There are also a number of opportunities to find suitable falls prevention programs in your local area by visiting the Active and Healthy website. The most effective way to reduce your risk of falling is to look at a number of the reasons below that can cause you to fall and how you can make changes to avoid these risks. A medication review by your family doctor or pharmacist can help decrease your risk of falling. Carrying a list of your medications that can be reviewed by the doctor can also help you avoid new medications that may affect your balance. This might happen through medications interacting badly with each other or doubling up on medication with different brand names. An eye test at least twice yearly helps to identify problems with your eyesight. Often action can be taken that will help to improve or at least slow down this problem. One easy way to help your vision is to clean your glasses regularly and to wear a broad brim hat when it is glary outside. Sometimes surgery will be needed for those with cataracts. Decreased bone density can result in greater injury when you fall or stumble. The correct amount of calcium and Vitamin D can help to prevent this occurring. You can talk to your doctor about finding out about your calcium and vitamin D levels and see a dietician about how much calcium and vitamin D should be in your diet each day. Homes can be full of trip hazards and other possible causes of falling. About half of all falls occur in and around the home. A review of your home can help to reduce these risks. Removing or adhering mats can help to stop you tripping particularly when the edge of the rug or mat is rolled up. Cleaning up spills immediately means you are less likely to slip over. Tidying up clutter such as newspapers and magazines stored on the floor removes another obstacle. Good lighting throughout your home helps to stop trips. Using a night light can keep you safer when moving around the house at night. Marking the edge of stairs with specific tape can increase your ability to tell where one stair finishes and another one commences. Using handrails when going up and down stairs also lessens your chances of falling. Bathrooms can be slippery and may require a hand rail to offer support. A supportive handrail to assist when getting out of the bath or shower can prevent holding onto taps and towel rails. Hand rails should be professionally recommended and fitted. Cords and cables across walkways can cause trips and should be placed safely out of the way. Outside the home pathways should be well maintained with over hanging branches and vegetation removed, paths swept and moss removed. Trip hazards such as garden tools like shovels and garden hoses are best put away after use. Outdoor stairs require a sturdy handrail as they can be slippery particularly when wet. Poor footwear. Many falls are the result of poor footwear. Shoes should be well fitted, have a sturdy heel and a nonslip sole in good condition. High heels and poorly fitted shoes such as sloppy slippers can be a trip hazard. Medical conditions can also result in a fall. Have a regular medical check-up to help reduce the risk. Symptoms such as dizziness caused by low blood pressure or an irregular heartbeat can cause you to fall.